Cleaning out your gutter is not a glamorous task; you will likely get dirty and wet and will have to constantly move your ladder around. It is, however, very important for the weatherproofing and protection of your home and garden. 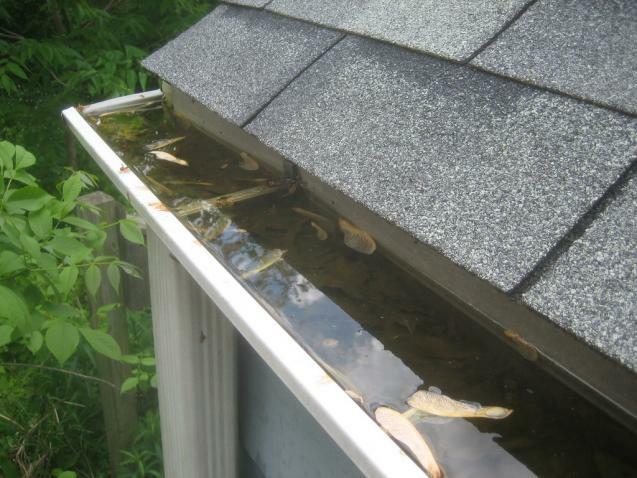 Overflowing gutters can damage the roof, basement and even the structural integrity of the building’s foundations. Anything else beneath your guttering, such as a flowerbed, can also get destroyed. It isn’t all bad news, though, as a little preventative medicine and regular maintenance can greatly reduce the difficulty of gutter cleaning so that you are ready for anything the elements throw at you. Gutter cleaning does not need to be difficult, although it can be dangerous if not tackled properly. This guide contains a number of tips to help you clean successfully and safely. 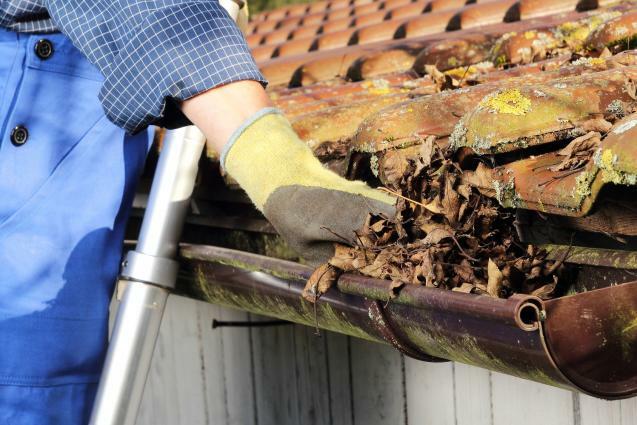 Gutters need to be cleaned regularly, once a year is ok but biannual cleaning is ideal. If you check and clean them regularly, your gutters will be a lot easier to clean, making it a much less time-consuming chore. 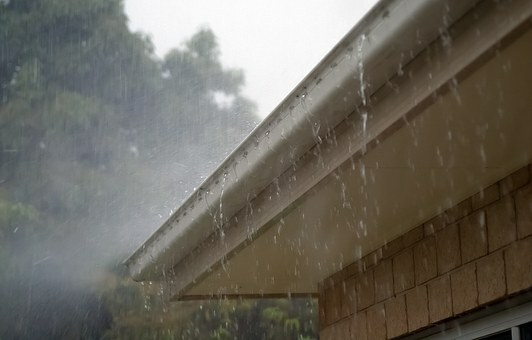 Clean gutters will slow down their rusting and help you avoid water damage to your paintwork, walls and doors. Going up ladders is not a safe task so it is recommended that you schedule their cleaning with a professional company; professional gutter cleaning companies will also know how best to clear debris and protect your home. · Always tell someone when you are going to work on a ladder. · Ideally use a ladder with a shelf or hook so that you can carry a bucket with you for the debris. · Check your ladder over for damage before use. · Ensure all screws or bolts are tight and any mechanisms are locked in place before you climb the ladder. · Ladder stabilisers are a good idea for extension ladders as they can reduce damage done to the gutter. · Rubber shoes can give you much better grip on ladder steps and reduce your chances of slipping. · Leather gloves are not advised, as they can be too thick and clumsy. · Cotton gloves can absorb the water and bring bacteria into contact with your skin. · Rubber gloves are good but don’t offer much protection from any sharp debris. · Thick suede is the ideal material as it offers the best combination of protection and manoeuvrability. Before you start on the gutter you should clean the roof, otherwise as soon as it rains again all the leaves and debris will wash into the gutter. You should use a rake and a garden hose or pressure hose to wash off the loose debris. A garden hose with a pistol-grip nozzle is advised as you can hang it off the front edge of the gutter while you scoop out debris or move the ladder. Scooping debris out of the gutter with your hands is one of the best ways to clean it. A gutter scoop builds on this idea to make life even easier. Gutter scoops can be metal or plastic, but metal is not advised as you can further damage the gutter by scraping the bottom. A plastic scoop offers a very thin front edge to neatly fit in the gutter and pick up any debris. When cleaning the gutter, you should start at the drainpipe and move away so that you don’t clog them up while cleaning. Once all the gutters are clear, check the drainpipes for clogs, run your hose down them at full pressure and if the water backs up and overflows you have a clog. Usually, tapping the side of the drainpipe is enough to remove any clogs. If this doesn’t work you will need to remove it from the house and open it up. Professional services can remove any health risk to yourself, meanwhile cleaning your gutters in an effective and long-lasting manner that will most benefit the long-term health of your guttering. 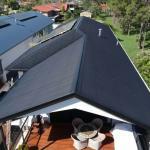 Contact us for free quote here. Cleaning out your gutter is an important part of home maintenance, something most people don’t realise. Do you know how to find the right reputable gutter cleaning service for your home? Potential water damage is rarely on the forefront of anyone’s mind, although it can end up being more dangerous and costly than many other forms of damage to your home. This may be because water damage doesn’t happen all at once. Here are 7 tips on selecting a reputable and trustworthy gutter cleaning company that you can count on! Follow these simply tips to find a gutter cleaning service suited to your needs.